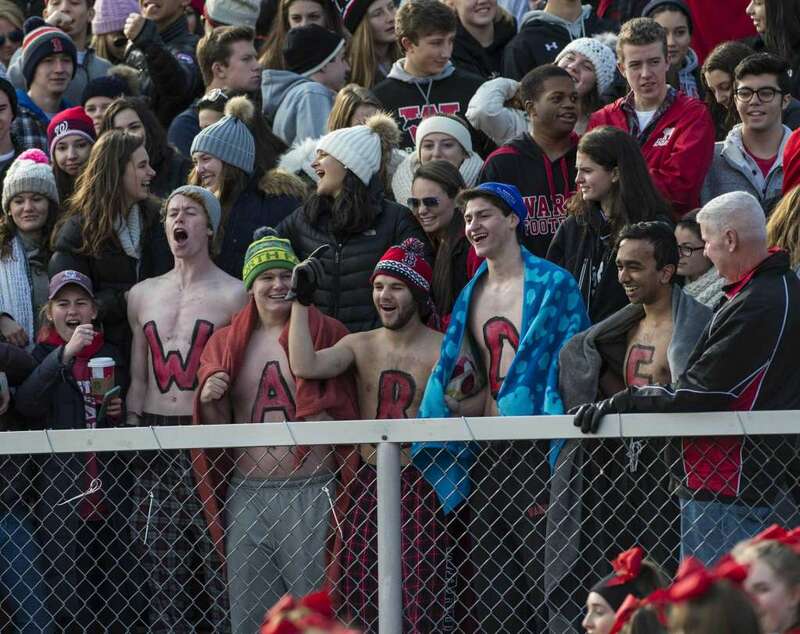 Warde Wins the Big Game! It was the battle of the high schools at the annual Thanksgiving Day football game. This year, Warde had the privilege of hosting this event, and the turnout was fantastic. Even before the game, the parking lot was packed with parents and former Warde Alumni, sharing food and stories from the Warde past. Even the weather complied, a bright sun greeting the fans and the team. 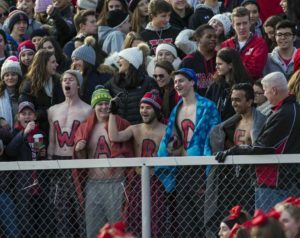 It was cool, but not too cold, proven when five Warde seniors showed up shirtless, the Warde letters painted on their chests. The stands, both Red, Black and White and Blue and White were packed full of students and parents, with almost no room to move in the seats. Both sides of town came together to support their teams, which was amazing to see. 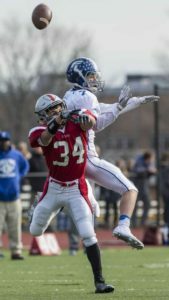 Warde started out strongly, with a sixteen point lead going into the second quarter, and Bryan Azarian leading the way with multiple touchdowns, winning him the title of game MVP. Mike Whiting and Aristotle (I’m not even going to try) also had great plays. “It was great to see our team working together so well to succeed,” Peter Friedrichs comments after the game. The Falcons were definitely off their game in the first half, one player missing the ball entirely when he went to catch it and it went through his arms, leading to a Warde interception. The pep band barely had time to eat their breakfast between playing the Warde Fight Song, probably a record amount of times this year, honestly. battle between their pep music, challenging each other with their songs. But in halftime, an alliance was formed! The Ludlowe cheerleaders and dance team, and our cheerleaders and dance team performed an impressive number, as one large performer. Fans from both sides of the field were cheering for them as they finished out and struck a pose, then took a group picture together. In the third and fourth quarters, Ludlowe began to come back in the game. Where Warde had been winning twenty to zero, Ludlowe scored touchdown after touchdown, but it wasn’t enough. Warde won the game 42-20! “It’s incredible so see our sports teams actually having a victory,” Anna Green says optimistically.